23 million. That’s the number of adults in the United States who streamed podcast episodes from their smartphones in March 2018. That’s twice the number who listened to episodes last year during this same timeframe from their desktop computer. The competition to draw in new listeners keeps growing with the podcasting’s popularity. So, what exactly goes into building one of those better shows that creates loyal listeners (and new customers)? The answer is strategy and planning. Getting started with podcasting involves more than just reading a couple of how-to articles, hooking up a microphone, and talking. Hundreds of little things have to come together precisely if you want to launch an unforgettable podcast that also supports your goals. If you’re looking to leverage podcasting’s popularity to start a new show to enhance your digital marketing strategy, we can help. In this post, you’ll learn some basic podcasting tips on what works (and what doesn’t) and get links to additional resources so that you have the knowledge you need to start building a podcast that gives a return on your investment. #1: Pick a topic—What’s your show going to be about? The first and most crucial step is deciding what you’re going to talk about. Picking a theme matters. Almost ten years ago I took an evening class from two seasoned audio producers on how to get started in audio storytelling. One had worked with the Kitchen Sisters on productions, and the other had been part of the team who creates RadioLab. These women knew their stuff, and this is the most valuable piece of advice they shared: think about what you enjoy talking about, and what you can talk about again and again without getting bored because, more than anything else, successful podcasting requires stamina and dedication as well as energy and excitement. Don’t set yourself up to fail by choosing a limiting theme for your show. Pick a big idea that’s sustainable. You should be able to mine your podcast’s primary topic for new episode ideas over and over. If you’re putting together episodes on a topic that you only have half-hearted enthusiasm for or a show that doesn’t have a rich well of material from which you can creatively draw from over and over, you’re destined to run into trouble trying to develop engaging content sooner rather than later. What interests your target audience? If you’re interested in making a show to attract potential new customers, think about what questions your sales team hears regularly. If you want to use podcasting as a way of nurturing your existing clients, identify what sort of information they seek out. Pro-tip: Is a podcast really the best way to reach your audience? If you’re excited to get into the world of podcasting, you might have skipped this step, but it’s crucial to consider. 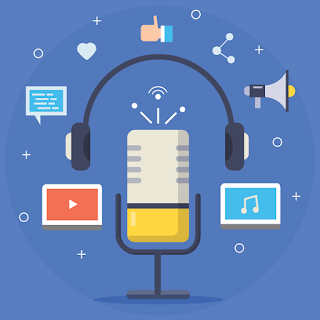 Creating an excellent podcast for an audience that isn’t interested in listening to audio might mean that podcasting is a losing proposition as part of your content marketing strategy. If you’re not confident that investing in starting a podcast is the way to go, try adding small snippets of audio to support your campaigns as a way of seeing if your audience has an interest in this type of content. Checking to see what’s already available can be a helpful part of your planning process. Check podcast directories, listen to a few shows, and think about how you can offer something different or better. If you have an interest in a topic, one way to stand out is to use your podcast to forecast trends and evolve with the subject matter. As you explore and do research, you can use episodes of your show as a platform for passing along what you’ve learned, just as you may already be doing by blogging. Pro-tip: To test the viability of your podcast theme, try to come up with (and thoroughly flesh out) a list of at least 20 different topics for future episodes. If it’s easy, you’ve got a winner. If it is a real challenge to even come up with ten episode ideas, it might be worth brainstorming some more until you find a topic you love (and your audience is interested in) that proves endlessly explorable. #2: Develop a strategy—What’s your production plan? Modern publishing schedules for podcasts are often fluid, but consistency is a great trick to employ as a way of building a loyal following. Take a cue from the Simpsons. For the last 29 years, you could turn your tv on Sunday night and catch an episode of Homer doing something ridiculous. With your launch, you’ll be setting expectations which is why you should think realistically (and carefully) about what you want your publishing schedule to look like before you launch. If you have the time, test your publishing schedule before you go live. For instance, if you’re thinking about a weekly release, see if you can meet this schedule by creating a few shows on deadline before you launch. By doing a test run, you’ll quickly know if the routine proves too challenging and you'll be able to reanalyze and tweak your schedule to be longer (biweekly? monthly?) before launching and setting expectations with your listeners. Or, you can try something completely different, like creating your entire season of shows and beginning with all episodes available from the start. The only way you can go wrong is to tell your listeners you’ll be back next week and then wait two months to release your follow-up episode. Is your show going to be scripted? Is it meant to be educational, fun, or perhaps both? Always planning to interview a guest (or guests)? Or will it be a panel discussion? And, who will host? Will more than one person share the hosting duties? Deciding these podcast format details will help you also plan for each show’s length. Just because you record for two hours, the final episode doesn’t have to be two hours. Edit, edit, edit. It’s better to run short (and keep your listeners hungry for more) than produce an extended episode that drags on and on (and makes your listeners tune out). If this is your first foray into audio editing, consider how you want to handle bandwidth and hard drive space issues from the get-go. Sound files take a lot of memory to edit, and you’ll need a secure place to store them, especially if you keep multiple versions of all of your assets from each episode. When you’re ready, you’ll also need to upload your substantial audio files to a hosting and publishing service—like LibSyn or SoundCloud—for distribution. To keep your sanity and make this task go more smoothly, avoid doing this sort of file transfer task over a weak or slow wifi connection. Pro-tip: It’s easier to stay organized if you make small decisions from the start, like how you plan to name your files. Come up with a naming convention and stick with it. It will make you look more professional to your audience when they download your episode files and help you keep all of your audio assets tidy. Develop an elevator pitch. If you can’t sell your show clearly, how will your listeners evangelize it to their friends and help you spread the word? Work on being able to describe what your show is all about in one or two brief sentences and how you'll add this promotional language naturally into each episode’s introduction. Work on your branding assets, and give your podcast a catchy name that communicates what your show is about. Pro-tip: When you pull up to your local cinema, how many posters include a film strip or camera? Even posters for movies about making movies aren’t that boring. So why is it that over half of all podcasters create logos featuring microphones even when almost all of those shows aren’t about podcasting? Make sure your podcast’s logo accurately communicates what your show is about and stand out from the crowd by skipping the microphone clip art (unless, of course, your episodes are about recording audio and you have no other ideas for a logo). Choose a syndication vendor to help you host and distribute your episodes. Buy and test your equipment and software, especially if you’re uncomfortable or have never used audio recording hardware or software before. Find a good space for capturing clear audio. Don’t wait until the last minute to see if your room is too noisy for recording clear audio clips. Look into getting a pop filter to help minimize popping noises and hissing, especially from plosives like Bs and Ps. Pro-tip: If you don’t have a sound studio, you’ll probably run into some issues that you should try to troubleshoot before capturing your final audio. Recording in a room with tile floors? Put down a blanket to minimize echoes and bounce. Capturing an odd noise or humming on your tape? Check out what’s plugged in. Appliances like refrigerators can cause extra sounds to your recording, and even your furnace or air conditioning can be culprits for annoying white noise. #3: Think about marketing—How will you spread the word? “If you build it, he will come.” Spoiler alert: podcasting isn’t like the ending of 1989 Kevin Costner baseball movie Field of Dreams. You have to put in some effort to draw (and keep) your audience. You wouldn’t launch a new product or service without a marketing plan, so why would you try to do so with a podcast and expect effortless success? Social media: Does your show require its own social media channels or do you plan to leverage your company’s existing accounts for promotions? The same thing goes for a website? Do you have a space to integrate archival links for your podcast as part of your company’s existing news and communications section, or do you need a separate home? Directories: Submit your podcast’s RSS feed to the iTunes store to make distribution simple and reach as many people as possible. Then, add your show’s iTunes feed link to other popular directories and services. Pro-tip: Now is the time to ask all your friends for help. Call in favors after launching to seed your podcast’s archive of reviews with positive feedback from your supporters. If you hear from a listener that they loved an episode, encourage them to leave you a five-star review. Reviews are an essential part of getting free exposure from iTunes during your launch period. The more positive reviews, the better. It might seem unnatural to think about how you plan to measure success before your show even launches, but it is actually the perfect time to make this decision so that you can set yourself up to succeed. For instance, if your podcasting success is dependant on getting new customers to sign-up for your email list or call to set-up a demonstration with a sales team member, you definitely won’t forget to add call-to-action prompts at appropriate spots throughout your show's script. Right now if you pop over to Apple’s iTunes Store, you’ll discover over half a million shows, and some options are better than others. If you follow these tips when planning your new podcast, you’ll have a better chance of standing out from the competition—for all the right reasons.